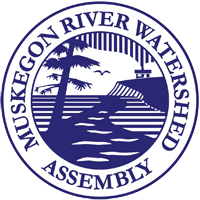 The Muskegon River Watershed Assembly was formed by volunteers in May 1998 to address the needs of the River and to assure that future generations are able to enjoy the River as much as we do now. In 2000, the MRWA was incorporated as a nonprofit organization and granted an exemption from income tax, under Section 501(c)(3) of the Internal Revenue Code. With the assistance from a three-year grant from the Wege Foundation and Great Lakes Fishery Trust (GLFT) in 2001, the volunteers were able to hire two full-time employees who took some of the load from their shoulders. Ferris State University provides two offices for employees at their main campus in Big Rapids. FSU has also provided the MRWA with student assistance. In 2011, the MRWA was also able to hire a part-time employee to perform some of the clerical responsibilities. Since the initial grant, the MRWA has been largely supported by the Wege Foundation through operational funds and project match. The Fremont Area Community Foundation provided additional operational funds for projects and activities affecting Newaygo County 2006 through 2015. The GLFT also provided a two-year grant in 2010 to assist the MRWA in accomplishing its mission through 2012 (one-year extension). The MRWA has an extensive data repository of documents and links to watershed-oriented data. Many projects and activities have been completed by the MRWA too.